Nathan Hale's Hazardous Tales: The Underground Abductor (9 out of 10) Graphic Novel, 128 pages, Hardcover. 2015, Amulet Books. My 8th grade son was put on the spot by his history teacher yesterday. She had him put on an apron and a scarf, and told him he was Harriet Tubman. They were just getting into her story, and I don't know if the teacher was putting him on the spot or not (she knows me, and knows he could handle it), but he was able to answer every question she threw at him. And it was all because of a graphic novel he read last year. 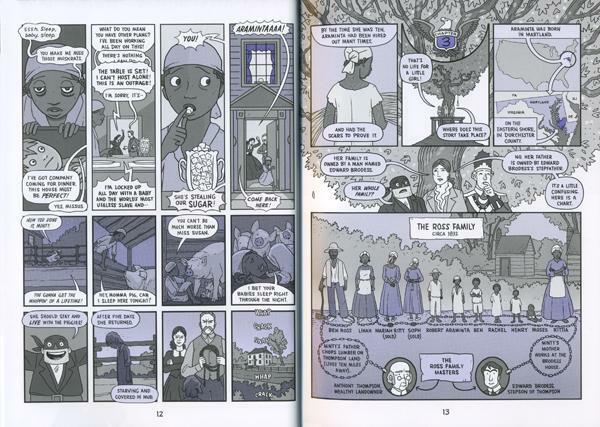 The Underground Abductor is the story of Harriet Tubman of course, and is the first in this series of graphic novels that's a biography of a single person. It's a break in the formula that Hale has established, but is still able to use one woman's story as an exemplar of what's happening in the wider story of American History. In this case, slavery and the abolitionist movement in the antebellum South. The premise is the same as the other books in this series: American patriot/spy Nathan Hale is at the gallows, about to be executed by a Hangman and British Provost. As he's about to die, he's able to magically see all of American History, and entertains the Hangman and Provost with the tales, Sheherazade-style. At the beginning of this story, the Provost (stuffy, very British) says essentially "all of these stories are about how America is so great, so special, the best country ever..." which Hale admits to, but does say that the country has made many mistakes, and that slavery is one of the worst. Hale (the author) lays out the history of slavery quickly, getting us up to the 1830s, when Harriet Tubman was a young girl. Back then she was "Araminta Ross," and she keeps that name for the half of the book before she escapes to freedom. Her story gives us a good look at what the institution of slavery was like in the south at the time...in a word, terrible. 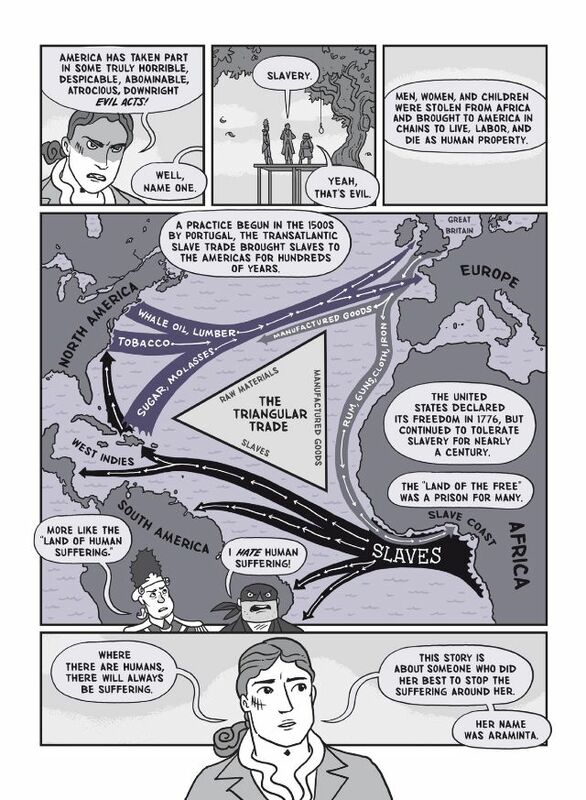 Hale is able to do this in a way that honors the pain and condemns the horrors of slavery, but is still appropriate for the target audience of 5th - 8th graders. I wouldn't say it's sanitized; he gets into the fugitive slave laws, and punishments including hobbling. He describes and shows the beating of Araminta and other slaves, and there are passages that are a hard read because of that. 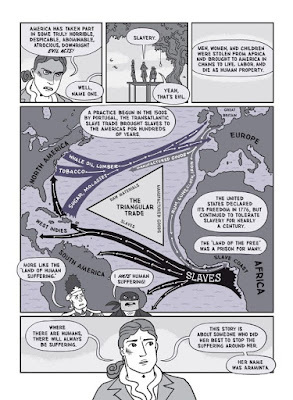 Throughout, Hale's cartoony style of illustration is able to convey the humanity of these people, but soften some of the harder edges of history. In the middle of telling Harriet Tubman's story, Hale takes two small detours to tell other stories that fit into the same time period and subject: the Nat Turner Rebellion and the story of Frederick Douglass. He's able to tell both succinctly, and their inclusion gives us a broader view of what was happening outside of Tubman's relatively small world. With the announcement that Harriet Tubman would be replacing Andrew Jackson on the twenty dollar bill, it's fitting that we (and our students) brush up on who she is and her remarkable accomplishments. The Underground Abductor is a fine way to do that.